First, I forgot that I had a biopsy scheduled (just a mole…probably nothing, just to be sure it was nothing to be worried about)…and the doctor’s office always takes forEVER!! I think I sat in the waiting room like an hour and a half before I even got into a room! UGH! So basically, by the time I was done, half the day was gone…since it was late enough in the morning that there just wasn’t time to get started on my scheduled zone before I left…SO FRUSTRATING. And by the time I got back, I was tire and hot. It’s triple digits here, so just having to venture out of the house is exhausting. So basically, I didn’t get much done that day. Some, but not the whole area I was supposed to. OUR WASHING MACHINE SPRUNG A LEAK, flooding the laundry room!!! Luckily it was as simple as the drain hose just needed to be replaced, something that we could handle without having to pay someone. But…it meant I spent one full day running errands because I ended up having several other errands I had to run that day as well and everything just took FOREVER! Plus I decided to also replace the other hoses while I was replacing the drain hose…learned from how-to videos that the rubber ones we had weren’t as reliable. Anyway, the day totally got away from me and of course afterwards, I was, again, EXHAUSTED. So no purging or cleaning at all that day. And THEN, the next day was the day to work on the washer and dryer (because I also decided that since I was going to the trouble to do all this, I should take care of vacuuming out the dryer vent as well, because I have been meaning to do that for a very long time…fire hazard and all…) and of course, there’s a ton of stuff that has fallen behind the washer over the years that is now soggy and wet and GROSS from being back there…and there is just a giant mess of YUCK to clean up. I cannot just leave it. 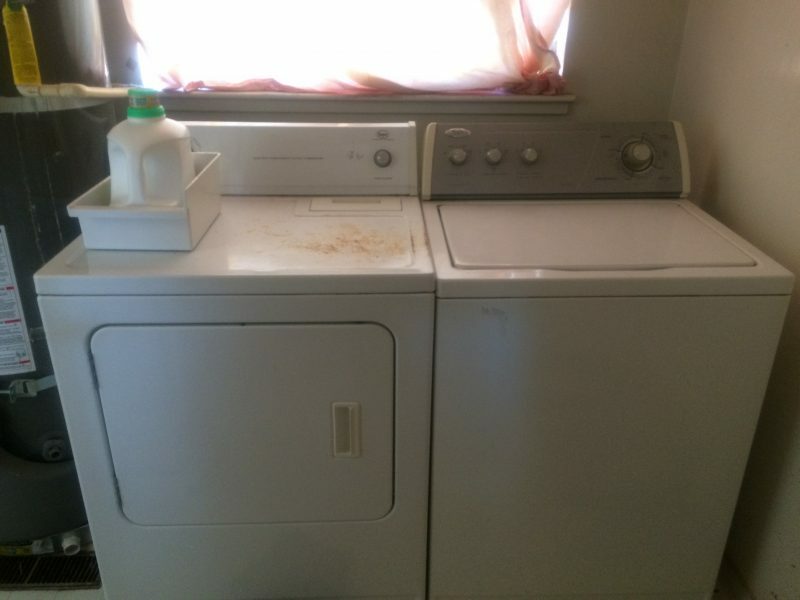 The soggy, messy grossness behind our washer. So there’s a ton to clean up. Takes literally hours of mucking the gunk out and cleaning and wiping and oh, it was fun, lemme tell ya. Luckily, my kids helped, bless them. And thank heavens for heavy duty rubber gloves! I put a load in and watch it and everything seems to be going well…it was actually pretty dang easy to swap out all the hoses. Our machine didn’t even require pulling it apart to get to the drain hose like a lot of the how-to videos, thankfully. Luckily they had taken care of some of it…enough to allow me to finish my shower…so I was in no real hurry. I was already exhausted and I was thinking “how in the HECK am I going to fix this? ?” Thinking thinking thinking while I’m in the shower. Because I knew exactly why it had come out. There was a sort of jury-rigging in where the hose attached to the U-hose that went into the pipe that led out of the house. It was just squished in there and then the clamp that went on it to hold it in place wasn’t very tight. And I KNEW it just didn’t feel very tight. I had been concerned, but it had been like that with the other hose, so I figured it would just work. SOOOOOOO….I finally take a look at it. Standing in a puddle of water. Warm, soapy water, at least. And the floor was already clean by then, at least. Now even cleaner! Finally my exhausted brain realizes that I don’t need that U-hose….just stick the stinkin thing DIRECTLY into the dang pipe! It’s made to curve, for pete’s sake!! So that’s what I did, and pitched the U-hose and loose clamp and it WORKED!! Yes, I’m very proud of myself, LOL! All clean and tidy!! And working again! So all this to say that I didn’t get around to posting about my Purge and Clean this week because I only actually got SOME of it done…but I am trying to catch up on it this weekend. We’ll see how far I get. I did some today, and I’ll continue tomorrow. It’s a lot to get done, but the zone I’m in right now really has a lot to get through…it’s my art area for my kids and where I keep all the school books, notebooks, pencils, etc… So I’m wading through a ton of old stuff we don’t need anymore or that we never finished. And trying to decide if we’re ever going to get to it. Tough decisions to be made. I’ll post as soon as I have something to post. Tina's Nature Adventures are coming! !